As a fairly new food blogger, I am constantly learning as I go along. Developing a recipe – no problem. Styling and taking photographs of my plates – working on it. But lesson #1 is to never try and cook, photograph and blog while your toddler is home. The terrible two year old is in a fabulous daycare during the week, so I can work in relative peace. I say relative because I still have my 77 year old mother to deal with, but she has an active social life, and does her own thing. I fatefully decided that I could cook and interact with my daughter last Saturday. She is at the point where she plays well by herself, and does not need constant supervision. Unless it gets really quiet, then I know she is up to something. The kitchen is open to the family room, so I can keep an eye on her while she plays or watches a DVD. But occasionally she would head to her room to play, and it would get quiet. Too quiet. So off I would go to make sure she wasn’t twirling the cat by the tail or drawing a portrait on the wall with crayons. Then back to the kitchen I would go to keep working on my recipe for lamb kofte. But while checking on my daughter and cooking my recipe, I completely forgot to take pictures of each step of my recipe! I always try to have step by step photos so the average person can see what I am doing and feel confidant following my recipes. So that said, the only picture you get is of the finished product. Luckily this is a simple to make recipe, and easy to follow. Kofte are cigar shaped lamb sausages popular throughout the Middle East. Different countries vary the spices and types of chile pepper used, but the recipes are all basically the same. In a food processor, pulse the onion and garlic until finely chopped. Add the parsley, aleppo pepper, allspice, salt, cinnamon and cumin. Pulse until combined. Add the lamb and pulse just until well mixed. Heat the oven to 350 degrees F. Divide the lamb mixture into 12 portions. Form each portion into a ball, then roll into a cigar shape. Place the sausages onto a baking sheet sprayed with non stick cooking spray. 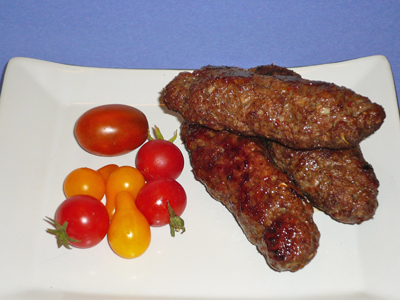 Lamb Kofte can be grilled or broiled also. Skewer each sausage, then grill or broil 5-8 minutes, turning occasionally, until done. Bake the kofte for 20 minutes, turn over, and cook another 10 minutes. Serve your kofte with pita bread, hummus, chopped tomatoes and chopped onions. Rice pilaf is also a nice side dish with the kofte. *Aleppo pepper is a mild, bright red pepper with a fruity, balanced flavor. Aleppo pepper can be found in Middle Eastern stores. It can also be ordered online at these reputable spice merchants. I recommend added it to your spice collection. A nice,cool yougurt/cucumber sauce would work wonders with that Kofte. Oh, yum! I am actually making meatloaf tonight (with beef), but I so wish I had ground lamb instead, I would totally switch gears and make this! You can indeed make them ahead. In fact, the flavor will be even better, having had time to marinate. Just wait, Cheryl, until your daughter is old enough to cook WITH you! It’s not as long as you think. Mine are now 7 and 10 and each makes a very able helper in the kitchen. A few years, a few years…. I am making this recipe THIS WEEK for sure. It looks delicious and so easy! Perfect for a weeknight dinner – you can even make the mixture at night, shape the logs, stick the baking sheet in the oven, and then pull it out and bake it the next night, right? I sometimes forgot to take pictures of some ingredients, and some cooking steps too. You spicy lamb looks yummy.